Northwest of Brothers, Oregon, I turn off Highway 20 and leave the lean, high desert of eastern Oregon behind. Headed for Oregon’s Cascade Range, I drive north on a level two-lane road past scattered ranches under a wide-open blue sky. The road rises, and the land begins to change from brown to green. Clumps of trees dot the distant, rounded hills. Soon the trees crowd the edge of the pavement and begin to blot out the sky. I lose the sky for good on a blacktop road that winds up into heavy timber. When I drop down the west slopes of the Cascade Range and into the Pacific Coast rainforest, the air temperature drops twenty degrees and grows heavy with humidity. After dark, at a fork in the road, I turn west where I should have turned northwest. I start looking for a motel room, but I can’t find one. So I keep driving. Hours later I stop to check my map, and then turn onto a gravel road that runs down the side of a long hill. When the road levels out among a stand of large dark tree trunks, I pull over and lower all four car windows. The sound of rushing water fills the cool night air. I turn the engine off, eat a hard-boiled egg and a can of tuna in the front seat, then go to sleep in the back seat. At dawn I wake up next to a trout stream. I am thinking about the coastal cutthroat trout, the trout that has brought me to the northeastern corner of Oregon. Reaching over the passenger seat I pull a postcard out of the glove box. 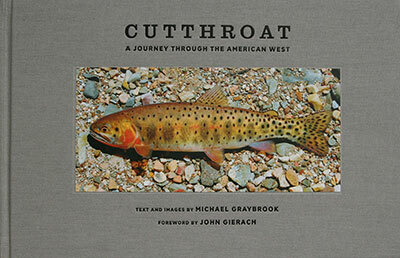 The postcard is an image of a coastal cutthroat trout by the illustrator Joe Tomelleri. Like the first time I laid eyes on the print, I can’t stop looking at the deep purple-blue parr marks on the trout’s golden colored side. The coastal cutthroat trout is one of most brightly colored of the cutthroat subspecies, and one of the most heavily spotted. I want to see one for myself. I put the postcard back in the glove box and get out of the car. The dawn light is dim and diffused. I look up into the dense canopy of Western hemlock and Douglas fir arching over my head. The tall, straight tree trunks look like columns. I feel like I am standing inside a room. Pushing aside ferns, ducking under tree limbs and strands of hanging moss, I walk to the water’s edge. 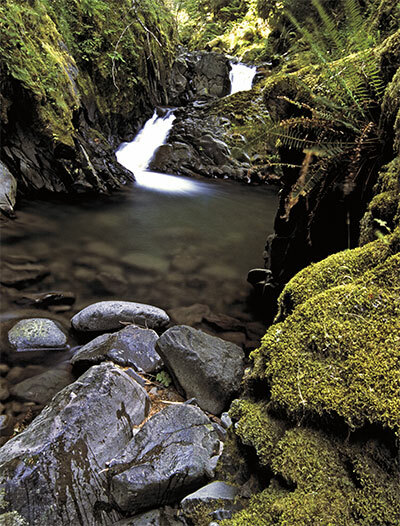 The stream, a tributary to the Clackamas River, cuts a forty-foot wide opening through the forest, swirling around moss-covered rocks and scattered boulders, forming pools, runs, and riffles. Water slaps against the rocky banks lined with tangles of roots, decaying deadfalls, and ferns. Even after all the times I have stood next to a trout stream, I still feel the jolt of adrenalin at the sight of new water. Walking along the stream bank I peer into the water, hoping to see a cutthroat, but the water is too rough to see below the surface. From the bent grasses and ferns along the stream bank it looks as though the water was recently very high, and the water lines on the sides of the rocks suggest that the water level is still dropping. I pull a thermometer out of my shirt pocket, step out onto a flat rock, stoop, and lay it into the shallow water at the edge of the stream. The water temperature is 44°F—cold enough to slow a trout’s metabolism, and cold enough it might be a little lethargic, and difficult to catch. The sun is up now. Long thin knife blades of sunlight streak through the gray-green foliage to the forest floor. I walk quickly back to the car and prop open a map against the steering wheel. 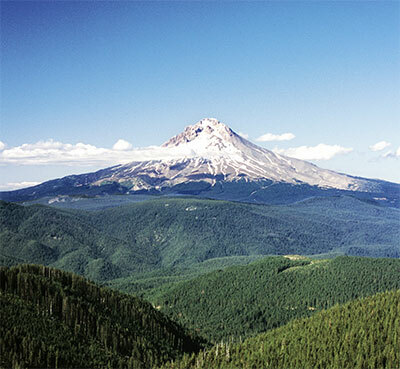 Mount Hood, at over 11,200 feet, and the highest peak in Oregon, dominates the map. It is less than twenty miles away and I can’t see it to save my life. Mount Hood lies near the center of the Cascade Range, a 700-mile-long stretch of rugged, forested mountains, averaging 3,000 to 5,000 feet high. The higher peaks, topping out at 10,000 to 14,000 feet, are snow covered, and march single file from Lytton Mountain in British Columbia, south to Lassen Peak in northern California. Not sure of my surroundings, or my precise location, I start the car and drive upstream. The road I am on changes from gravel to dirt and back to gravel, and generally follows the stream. In places, the road climbs high above the water giving me a bird’seye view. When I come to the upper end of the watershed, I turn around and drive back downstream about eight miles to where the water enters a small lake at a public campground. I’ve been told this is a good place to camp. I drive the entire length one more time, putting all the pieces together, picking out the good-looking water that I can see from the road. Then I get down to the business of catching a coastal cutthroat. Near the upper end of the drainage I fish some riffles and pocket water by the side of the road. Nothing. I head downstream and try a few likely looking spots. Again, nothing. Back upstream I fish a deep pool where it glides through a jumble of huge downed trees stripped of their bark. Still nothing. By midafternoon I am desperate to catch a coastal cutthroat. I begin to feel tense. Driving up and down the road faster and faster, I hurry to each new spot, throwing flies, my arm tiring. Then I recall what my grandfather said to me when I was a boy fishing with him back in Indiana, and I couldn’t catch any fish. “You’re not holding your mouth right.” I was never sure what he meant by that, but for a while I concentrate on holding my mouth just right: Mouth fixed in a slightly open position, and a look of hard determination. The trout don’t care. It is now late afternoon, and I still haven’t seen a sign of the coastal cutthroat trout. I keep fishing. An hour later I regret not buying a few of the gaudy colored local flies next to the cash register at the gas station yesterday. Then I tell myself it’s only the cold water temperature. I fish through the falling light of early evening, then give up. The only coastal cutthroat I have seen so far is the one on the postcard in my glove box. Driving back to the campground I have a deep sinking feeling that this may not work out. The campground has only a few other campers and I pick a campsite on the edge of the lake, and set up my tent in the dark. I fall to sleep with a head full of doubt. In the middle of the night I wake from a sound sleep to the crunch of car tires on gravel. Someone pulls a car into the empty campground space next to my car. Alarmed at first, I lie there and listen. The engine idles for several minutes, and then stops. I hear a car door open then shut. I hear what might be a tailgate, and footsteps walking away. Then nothing. I think about getting up to see what’s going on, but I don’t hear another sound and I fall back to sleep. At dawn I’m woken again. This time to the crack of breaking branches and the smell of campfire smoke. I sit up, unzip the tent fly, and fold it back. Looking out through the opening of my tent and through the mist rolling off the lake, I see a fisherman. He is sitting, fixed like a statue in a folding chair, three lines running out into the water, a thermos balanced on a large rock, and his feet propped up on a cooler. I watch him for several minutes. He doesn’t move. Then he leans down, picks up a stick from the small pile next to his chair, and throws it onto his campfire. The local guy. Crank, sage, or plain old drunk, I have met them all. The local guy, the guy that’s already made up his mind about you based on nothing more than your out-of-state plate. Always on the lookout for a little local advice, I am about to get a mouthful. 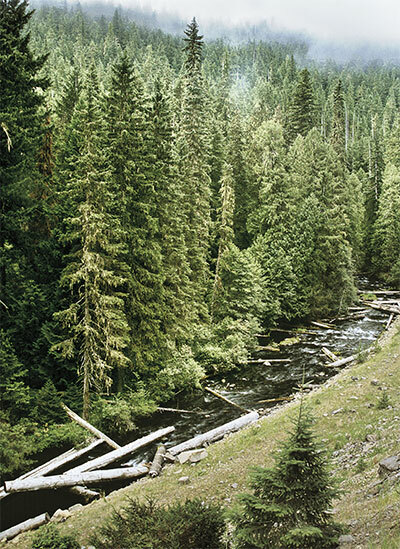 Tributary to the Clackamas River, Oregon. The local guy goes on and on about the high and cold water, there are not as many trout as there used to be, the cost of gas, and the ATVs that make too much dust. Then, getting a little excited, he gets up out of his chair and rambles on about his ex-wife and her two yapping dogs chained next to the refrigerator on her carport. I tell him that I came here for the coastal cutthroat trout, but he already knows that. I’m sure he took a good look at my fly rod strung up inside of my car. And before I finish giving him the details about my fishless day he cuts me off with, “Well you’re not going to catch anything on that dry fly.” And he tells me that I had probably been fishing the “wrong water,” the places “hammered” by every other fisherman, and that I should look for the places “nobody bothers with.” I hang onto every word. He goes on to say that if he were fishing the stream for cutthroat trout, he would fish the calm, slow, “quiet water,” and not the fast currents. Then he mentions the turnoff to a lookout, “way up on top,” with a view of Mount Hood; a view I wouldn’t “get back in Pennsylvania.” This comes with a warning about the loggers who run their huge rigs down the mountain fast and full of Douglas fir, and that they don’t think much about sharing the narrow road. And he says that if I do decide to go up to the lookout, I better wait until after the last evening run. He invites me to stop back for a beer or a “touch of something else,” if a logging truck “don’t run you off the road.” Just before I turn to leave, he looks right into my eyes, and says to me in a firm sure voice, “Cut the damn dry fly off.” Driving off to find my coastal cutthroat I glance back to where the local guy, back in his folding chair, stares down into the bottom of the lake. The coastal cutthroat has the broadest distribution of any cutthroat trout, a 2,000-mile-long strip of Pacific coast, all the way from northern California up to the Kenai Peninsula of Alaska. Most populations of coastal cutthroat are found within one hundred or so miles of the coastline. This range overlaps with the temperate rain forest region of the Pacific Northwest. The west slopes of the Cascades catch most of the moisture that comes in off the Pacific Ocean. About 120 inches of precipitation fall annually on the west slope of the Cascades, keeping the cutthroat streams running full, and cool, moist and smelling sweet. There are four forms of coastal cutthroat trout. 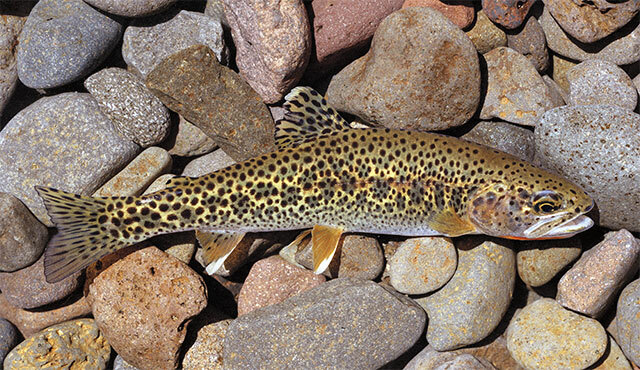 The sea-run form is the only cutthroat trout that spends any of its life in salt water. The lacustrine coastal cutthroat is a lake form, and the fluvial coastal cutthroat lives mostly in large rivers. These three forms of coastal cutthroat migrate to smaller rivers and tributaries to spawn. I don’t know where to find or how to catch these trout, so on this trip I am sticking to the fourth kind, the stream-resident cutthroat. With the campground behind me I drive upstream with the water on my right. The trees and ferns hug the edges of the road, ghostlike in a thick covering of gray road dust. In the dim morning light a bobcat appears, then disappears like a trick. Dirt pullouts border the stream every quarter mile or so, where anglers or hikers leave their cars. From the larger pullouts, well-worn trails lead through the trees, angling down, always toward the water. Because it is the middle of the week, I have the place almost to myself. Taking the local guy’s advice, I search for the remote, out of the way stretches of stream, the places that may not see many fishermen. So I look for the least used, most lonely looking pullouts, the pullouts on the wrong side of the road, the ones that leave your car hanging a little too far out onto the road, or the ones so high up that once you do manage to get down to the water, you’re not sure how you will get back up again. At some of these places I follow anglers’ trails part of the way, but then I veer off onto the narrow paths animals have worn into the soft ground. When the undergrowth becomes dense, I make better time walking on the backs of downed trees three and four feet in diameter, some over one hundred feet long. I begin casting a small weighted streamer up and across the tail of a long shaded run, tight to the bank. The streamer sinks and drifts with the current. At the end of the drift, as the streamer swings in the current, I give it a little twitch. Finding a rhythm, I work my way upstream. Cast, drift, twitch. Cast, drift, twitch. When I stoop to pass under a low-hanging limb, a flicker of light on alder leaves turns my head to the far side of the stream. And I see a small tributary, about fifteen feet wide, tucked back in the thick woods. Drawn to the small water, I push aside the thin branches and enter the tributary under a low ceiling of close, tight trees. Where the tributary fans out into the main stem, the water is thin and rippled, probably too shallow to hold a trout. But just upstream the stream narrows between the steep banks of a little hollow. Here the water deepens, sliding through a series of dark pools. Here in the “quiet water,” I land my first coastal cutthroat trout. A row of parr marks, tinted purple-blue, run along the golden colored flanks of the eight-inch trout. The trout’s fins are tipped in white. Black spots spill over and across the trout, head to tail, and down onto the pure white belly. There are so many spots that for a split second I think the trout could be a rainbow trout. Then dropping to my knees in the shallow water, I pull the trout close, and my eyes lock onto the bright red cutthroat mark beneath the jaw of the trout. I catch another cutthroat on the streamer, switch back to a dry fly, and then catch a few more cutthroats farther up the tributary. To photograph the trout I carefully place them in shallow pockets of water where small patches of light sneak through the trees. The light doesn’t stay in one place long and to make the photographs I sometimes have to move the trout and follow the light from one side of the stream to the other. When one patch of light disappears I find another and follow it. By late afternoon I have my first photographs of the coastal cutthroat trout. But I grow tired of chasing the light. I want to see the sky. I want to see Mount Hood. Soon I am racing up a steep narrow road, where I hit a long straight stretch of smooth asphalt and slip into fifth gear for the first time in two days. I climb up and up through a tunnel of thick forest, a blur of green colors. I pop out of the dense conifer and into the blinding light of an open ridge and there it is—snow-capped Mount Hood busting out of the stick-straight lodgepole pines. I turn off the ignition and stare, my hand shielding my eyes from the bright light, my boots and pants still wet from the home waters of the coastal cutthroat trout. Later, by firelight, the local guy and I sit on the edge of the small lake. The smoke rises from his campfire straight up through the trees. Moonlight flashes off the lake and silhouettes the edges of the leaves in silver. We tell each other about the ones that got away, and the ones that didn’t. Late in the night, warmed by the campfire and a “touch of something else,” I adjust the size of one of the coastal cutthroats by an inch or two. But when I tell him of the purple and gold hues, and the white-tipped fins, it’s all true.